Confessions of a Fabric Addict: Make-A-List Monday - Where Are My Minions???? I had SUCH a productive week last week - and managed to knock out everything on my list by early Saturday afternoon! It was a Christmas miracle!!! But I started thinking about what needs to be done next and I have only one question... where ARE my minions? 1. Bind the Rockin' Rectangles quilt. 2. Write a tutorial for that quilt. Done! It turned out so nice - it's such a peaceful color combination that it's restful just looking at it! You can find more pics and the tutorial here. 3. Quilt the memory quilt tops. Done! And they're already delivered and being well-loved. 4. Find matching thread for a customer quilt. Done! Fortunately I didn't have to go far or look hard to find just the perfect color. 5. Quilt another Rockin' Rectangles top. Done! I'm liking this one a lot, too... Tutorial will be up this coming Sunday! 6. Contact sponsors for Hands2Help Challenge. Done! I spent last Thursday chained to my desk (my newly cleaned desk, I might add!) and didn't get up until I had sent out more than 30 sponsor emails! The responses have started coming in, so it's a lot of fun to check my email these days! We didn't have any requests this week, which gave us time for some housekeeping tasks. We went through this entire bookshelf of quilt tops just waiting to be quilted and sorted them out. Adult quilts are in one area, children's quilts are in another. Every top has a back with it. Some that were small were pulled out to be made larger. There's a lot of quilt tops in there just waiting to be finished - and now it's easier to find what we need so we have the right quilts on hand! It also made us realize we need to find a special place for some kids' quilts (there are a lot of them!) and we are exploring options for that right now. And in addition to that, I put binding on four ministry quilts yesterday! They are washed and dried and ready to hit the shelf, waiting for their recipient to come along. 1. Quilt a black and white ministry quilt, and add a red flange to the binding. 2. Write a note of encouragement to go with one of the ministry quilts (special request). 3. Layout a t-shirt quilt. 4. Write an estimate for that quilt. 5. Write tutorial #4 for the Rockin' Rectangles series. 6. Quilt the Rockin' Rectangle quilt #5. 7. Write tutorial #5 for the Rockin' Rectangles series. 8. 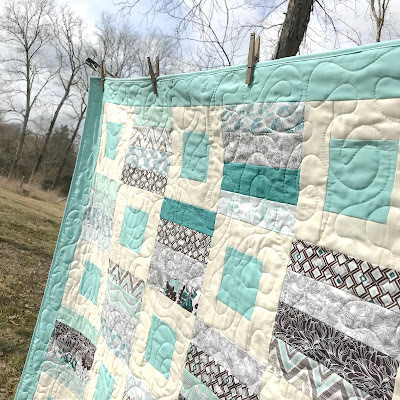 If the sun EVER shines again, take some quilt pics! 9. Write up a handout about H2H for potential sponsors at QuiltCon. 10. Answer some interview questions for a friend. 11. Starch and press a vintage top preparatory to starting repair work on it. 12. Keep up with any quilt ministry needs that come up. See what I mean? One reason why it's so long is because with QuiltCon next week, I need to try to get a little bit ahead of the game. It's going to take some special grace to get through all of this week's list, but I'm going to try. Wish me luck! And now, the question is - - - what are YOU working on this week? Wow you are one busy person. I think I did good to get one quilt quilted last week and have another on the frame for this week. I want to start a mystery quilt and a quilt along. Heres hoping to stay caught up. I love how you keep busy in your quilting world :)! I recently made some big heart patchwork blocks, and used an old but beloved knit fabric for backing - not the easiest to quilt with, but got it done yesterday. Big quilts are hard to maneuver in my little corner on my small domestic sewing machine - so I am especially pleased and thankful at this accomplishment. taking four borders apart to get the "wavy" under control and keep on checking in with daughter in the hospital - you are always so busy I don't know how you do it. I have got to cut fabric this week for multiple projects!! I need to do some writing as well. Whatever it takes- you will have a blast at Quilt Con- make sure to give us all a report! I need to finish a Valentine's Table Runner before Valentine's passes me by! And start my projects slated for February Challenges. Good luck with your list. I have a QOV on the frame to quilt for our guild and I'm putting the sashings and borders on my Place Your Bets. I sewed up a little quilted cosmetic bag for a Valentine's gift for a friend. It has been a fun week of sewing. 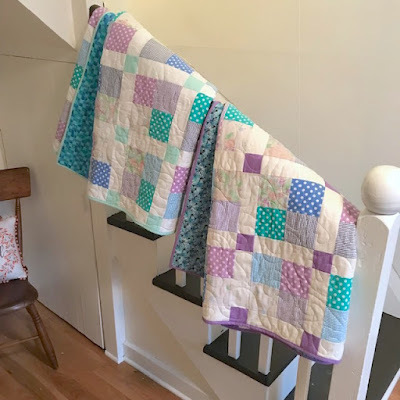 Question -- would the Rockin' Rectangles "It's Hip to be Square" quilt be acceptable as a size for Sacramento Hospital's terminally ill patients?? I have oodles of 2.5" strips cut from my stash...thinking this would be a quick quilt to turn out.